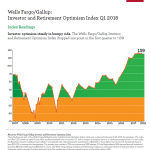 CHARLOTTE, N.C.--(BUSINESS WIRE)--The Wells Fargo/Gallup Investor and Retirement Optimism Index remains at a 17-year high, with the index at +139 in the first quarter. This is essentially unchanged from the past two quarters, but up from +126 a year ago. The last time the index exceeded the current level was in September 2000, when it was +147. Investors remain solidly optimistic on three economic aspects — economic growth, stock market performance and unemployment. Sixty percent of investors say they are at least somewhat optimistic about the 12-month outlook for these economic aspects, and fewer than a quarter are at least somewhat pessimistic. Investors are less optimistic about inflation than the other factors, with 40 percent at least somewhat optimistic and 34 percent at least somewhat pessimistic. The index is a broad measure of U.S. investor confidence in the investing climate. Retired investors remain more optimistic than non-retirees, with index scores of +155 and +134, respectively, which is similar to their confidence levels in the two prior quarters. The first quarter Investor and Retirement Optimism survey was conducted Feb. 12–25, 2018. Interviewing began a week after January’s solid labor report was released, but also after a major sell-off on Wall Street, when the Dow Jones Industrial Average dropped below 24,000. By the time of the survey, the market was already starting to recover. About half of investors, 52 percent, report feeling “not too concerned” or “not at all concerned” about recent volatility in the stock market. Just under half, 45 percent, say they are “very” or “somewhat concerned.” However, this is well below the 53 percent who reported concern after stock market volatility in 2015 and 64 percent in 2016. Although there is no difference in these concern levels by age, there are differences by gender —with 53 percent of female investors versus 38 percent of male investors saying they are “very” or “somewhat concerned” about the recent volatility. Further evidence that investors rode out the recent market swings fairly comfortably: Sixty percent say it is a good time to invest in the financial markets, unchanged from a year ago and higher than the average 51 percent recorded on this measure since 2011. This measure sank as low as 35 percent in the past, in September 2011. In addition, the 49 percent of investors who say they have “quite a lot” or “a great deal” of confidence in the market as a place to save and invest for retirement is up from 36 percent in February 2016. This also is the highest level of confidence seen on this measure in the six-year Wells Fargo/Gallup investor trend on this question. When asked to respond to a specific example, more than half (53 percent) say they could tolerate a market correction of 10 percent or greater over the course of a year on a $10,000 investment. “Taken together, these and other findings from the survey show many investors are optimistic about the future, yet realistic about any near-term challenges they may face in the current economic environment,” said Ready. While stocks offer long-term growth potential, investors should understand that stocks may fluctuate more and provide less current income than other investments. An investment in the stock market should be made with an understanding of the risks associated with common stocks, including market fluctuations. Investors are divided about the possible effects of new changes to personal and corporate income taxes on various sectors of the economy, especially job creation and the stock market. In the survey, 35 percent of investors say the changes to federal personal income taxes will be mostly good for them, 13 percent say they will be mostly bad, 24 percent say they won’t make much difference and 28 percent are unsure. Investors earning $90,000 or more are especially likely to say the personal income tax changes will benefit them, with 42 percent saying the impact of the changes will be mostly good versus 14 percent who say the impact will be mostly bad. By contrast, 29 percent of those making less than $90,000 say the changes will be good for them and 15 percent say they will be mostly bad. Thirty-six percent of investors say the changes will be mostly good for the country as a whole, and 25 percent say they will be mostly bad. The rest say they will make no difference (9 percent) or are unsure (30 percent). Slightly more say the new income tax law will be mostly good for the stock market (41 percent) and for job creation (42 percent). Meanwhile, more investors say their personal income taxes have already gone down as a result of the law (25 percent) than say they have gone up (8 percent). The percentage already seeing a cut in their federal income taxes is higher among non-retired (28 percent) than retired (16 percent) investors. Fifty percent say the corporate tax cut’s effect on the market will be mostly good, and 9 percent say it will be mostly bad. Forty-four percent of investors say the corporate tax cut will be mostly good for job creation, 40 percent see benefits for the country as a whole and 34 percent see benefits for themselves personally. One way the corporate tax cut could benefit investors is if corporations pass some of their tax savings on to employees, such as through pay increases or one-time bonuses. Roughly four in 10 investors who are currently employed by a corporation (39 percent) say their company already has or will provide such a benefit to its employees. When asked whether, under the new tax plan, investors now are more likely to save for their retirement using pre-tax or after-tax investments, the majority says their strategy won’t change (57 percent). In addition, slightly more say they will focus more on pre-tax (19 percent) than after-tax (12 percent) investments. One reason few investors are contemplating switching to after-tax accounts could be that just 25 percent of non-retired investors say they are “very familiar” with the difference between traditional and Roth retirement accounts. Another 36 percent say they are “somewhat familiar.” About a third (32 percent) say they are not too or not at all familiar. “By not making greater use of after-tax retirement accounts under the new tax law, people may miss out on a valuable opportunity to improve their tax diversification strategy, with after-tax Roth accounts providing tax-free income in retirement,1” said Ready. Although improved from four years ago, relatively few investors — 34 percent today versus 26 percent in 2014 — say they are highly confident they will have enough money to maintain the lifestyle they want throughout their retirement. Twenty-eight percent of non-retired investors, compared with 48 percent of retired investors, are highly confident about this. The poll also asked non-retired investors how much thought they have given to seven different aspects of retirement. At the top of the list: Non-retired investors are most likely to have thought about how they will spend their leisure time in retirement — 53 percent have thought “a lot” or “a fair amount” about this. Non-retired female investors are more likely than male investors to have thought “a lot” or “a fair amount” about paying for long-term and routine medical care. Men are more likely than women to have thought about their draw-down strategy. These findings are part of the Wells Fargo/Gallup Investor and Retirement Optimism Index, conducted Feb. 2–25, 2018, by telephone. The index includes 1,321 investors, aged 18 and older, randomly selected from across the U.S. with a margin of sampling error of +/- 3 percentage points. For this study, the American investor is defined as an adult in a household with total savings and investments of $10,000 or more. About two in five U.S. households have at least $10,000 in savings and investments. The sample size consists of 71 percent non-retirees and 29 percent retirees. Of total respondents, 36 percent reported annual incomes of less than $90,000; 64 percent reported $90,000 or more. 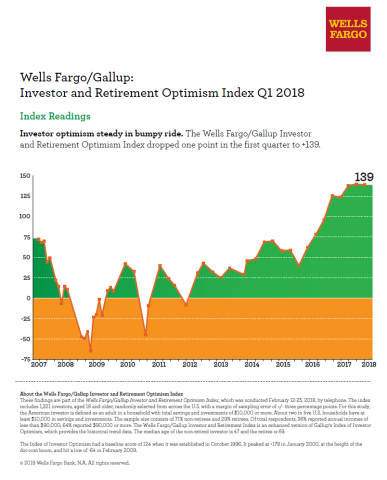 The Wells Fargo/Gallup Investor and Retirement Index is an enhanced version of Gallup’s Index of Investor Optimism, which provides the historical trend data. The median age of the non-retired investor is 47 and the retiree is 69. The Index of Investor Optimism had a baseline score of 124 when it was established in October 1996. It peaked at +178 in January 2000, at the height of the dot-com boom, and hit a low of -64 in February 2009. 1 Qualified Roth IRA distributions are not subject to state and local taxation in most states. Qualified Roth IRA distributions are also federally tax-free provided a Roth account has been open for at least five years and the owner has reached age 59 ½ or meet other requirements. Withdrawals may be subject to a 10% Federal tax penalty if distributions are taken prior to age 59½. Wells Fargo and its affiliates do not provide tax or legal advice. Wells Fargo Institutional Retirement & Trust is a business unit of Wells Fargo Bank, N.A, a bank affiliate of Wells Fargo & Company.